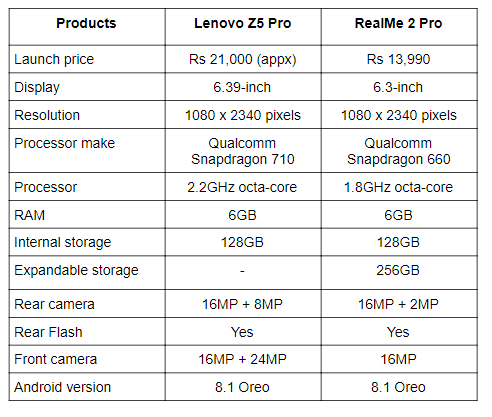 Today, we are comparing the Lenovo Z5 Pro with the RealMe 2 Pro to see which mid-range device offering the best under a limited budget? The Lenovo Z5 Pro comes with a Qualcomm Snapdragon 710 processor and a built-in fingerprint sensor. The device is priced at Rs 21,000 (appx). On the other hand, the RealMe 2 Pro, which comes with a dew-drop notch and a Qualcomm Snapdragon 660 processor is available in India at a price of Rs 13,990. Let’s just do a quick spec comparison of the two devices to see which one would be the right buy for you? 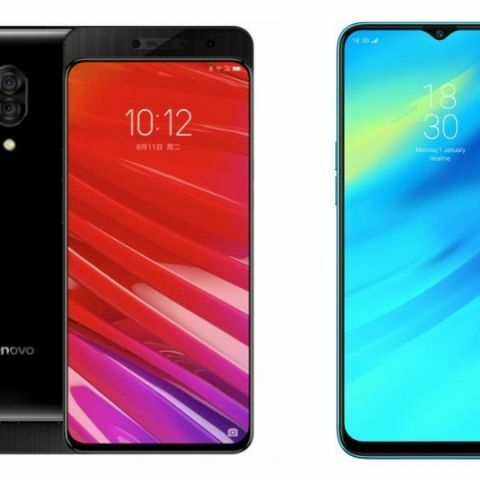 The Lenovo Z5 Pro features a 6.39-inch display that offers a resolution of 1080 x 2340 pixels. The smartphone is almost bezel-less as it has a notch on top, which can be turned off. On the other hand, the RealMe 2 Pro sports a 6.3-inch display that also offers the same resolution as the Z5 Pro. it has a dewdrop tiny notch on top of the display, which houses the front facing camera only. When it comes to the performance, the Lenovo Z5 Pro is powered by a Qualcomm Snapdragon 710 processor, which is paired with 6GB RAM and 128GB internal memory. The RealMe 2 Pro is backed by a Qualcomm Snapdragon 660 processor, which is also coupled with 6GB RAM and 128GB internal memory. When it comes to the cameras, the Lenovo Z5 Pro comes with a dual camera setup at both front and back. On the other hand, the RealMe 2 Pro features a dual 16MP + 2MP rear cameras along with a 16MP unit on the front.